We're far enough into 2019 now that New Year's Resolutions can be safely abandoned for being unrealistic and sucking the sweetness out of life. In place of your juice cleanse, we bring you this incredible recipe for hot chocolate from Emily Wight's Dutch Feast (a finalist for last year's Taste Canada Awards). Even better: it serves six. Invite the neighbours over for a little warmth respite. Where we live, it rains a lot—all the time for some parts of the year—and so we make the best of it. Hunter watches for puddles forming on the sidewalk, and when they are deep enough, he grabs his rubber boots and raincoat and demands to go outside. Aside from puddle-jumping, one of Hunter’s great joys is warming up after playing in the rain with a mug of hot chocolate—there’s not really any other time when he asks for it, so I am fairly certain he has tied a mug of chocolate and whipped cream to a feeling. Puddles are gezellig. Hot chocolate is gezellig. Of course, whipped cream is gezellig. Fair warning: This is pretty rich stuff. If serving to grownups, you can thin it out with a bit of rum or Kahlua. 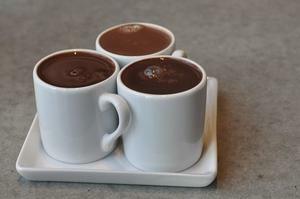 Tip: You can make the hot chocolate ahead of time and reheat it—just rewarm gently on medium heat. This will last for 3 days in a sealed jar in the fridge; shake before pouring the liquid back in the pot. In a heavy-bottomed saucepan on medium heat, melt butter. Whisk in cocoa powder and sugar, then pour in milk and cream. Cook, whisking constantly, about 1 minute, until mixture feels lukewarm to the touch, then add chocolate chips. Whisk constantly for 10–15 minutes, until it just comes to a boil. Whisk in vanilla. Divide between six mugs and serve. 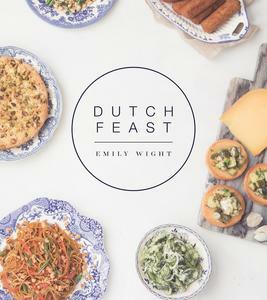 Excerpt from Dutch Feast, by Emily Wight. 2018, Arsenal Pulp Press. Appears with publisher's permission.